Our introduction to the Sussex Pet Rescue was through a training session I did early in the summer. 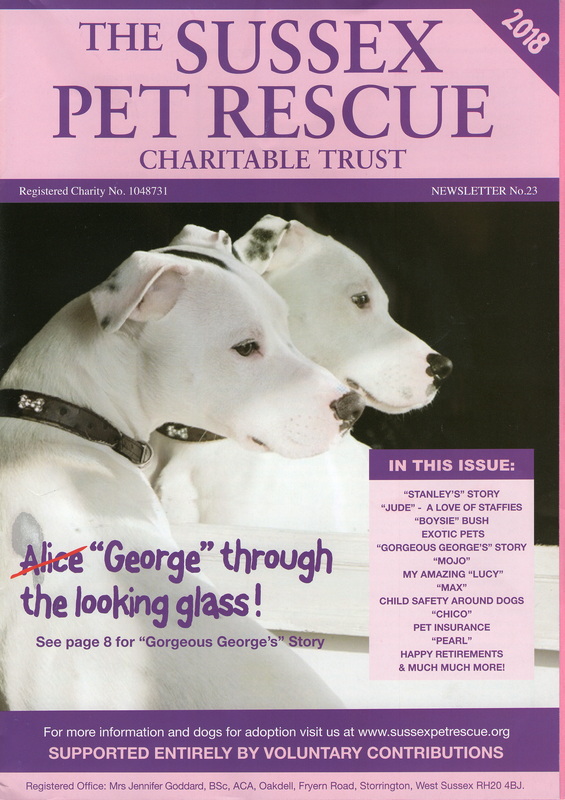 There was a pleasant surprise yesterday to receive a copy of their latest Newsletter with an article about my session with Pearl (and her brother Archie). 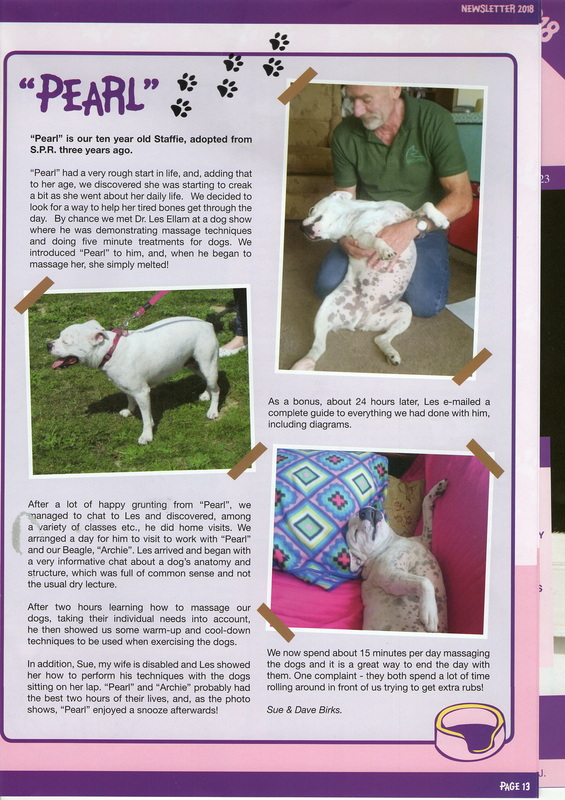 The article says “Pearl is our 10 year old Staffie adopted from the SPR 3 years ago. She had a very rough start in life, and, adding that to her age, we discovered she was starting to creak a bit as she went about her daily life. We decided to look for a way to help her tired bones get through the day. By chance we met Dr Les Ellam at a dog show where he was demonstrating massage techniques. We introduced Pearl to him and, when he began to massage her, she simply melted. After a lot of happy grunting from Pearl we managed to chat to Les and discovered, among a variety of classes etc, he did home visits. We arranged a day for him to visit and work with Pearl and our Beagle Archie. Les arrived and began with a very informative chat about a dog’s anatomy and structure which was full of common sense and not the usual dry lecture. After 2 hours learning how to massage our dogs, taking their individual needs into account, he then showed us some warm-up and cool-down techniques to be used when exercising the dogs. In addition, my wife Sue, is disabled and Les showed her how to perform his techniques with the dogs sitting on her lap. Pearl and Archie probably had the best two hours of their lives and, as the photo shows, Pearl enjoyed a snooze afterwards. As a bonus, about 24 hours later, Les emailed a complete guide to everything we done with him including diagrams. I’ll happily take that complaint!! Thanks Dave and Sue for the lovely write up. This entry was posted in acheypaw, achy paws, AchyPaw, achypaw myotherapy, Brighton Dog Massage, canine arthritis, canine arthritis management, canine myotherapy, canine myotherapy, dog myotherapy, achypaw myotherapy, myotherapy, achy paws, Dog, Dog massage, dog massage classes, Dog shows, massage benefits, RSPCA, RSPCA Brighton, Saltdean, south coast dog massage, Sussex, Sussex Pet Rescue, Testimonial, therapeutic massage, training and tagged acheypaw, achypaw, achypaw myotherapy, achypaws, arthritis management, canine arthritis, canine arthritis management, Canine massage, Dog massage, dog massage classes, dog show, east sussex, massage, one to one training, south coast dog massage, therapeutic massage. Bookmark the permalink.